I’ve seen the commercials for Shari’s Berries, and my mouth always waters as I think about their gorgeous chocolate covered strawberries. BUT, little did I know that there is SO much more to the Shari’s Berries website! Shari’s Berries goes beyond the berry to offer you a wide variety of delicious gifts delivered straight to your door or the home of someone you love. I ordered the Mrs. Fields Classic Crate. Oh.My.Word. I was in treat heaven. Thanks to the select your own delivery date system, I chose to have this gift basket delivered on Halloween. I figured if the kids were going to get a bag full of treats, that my husband and I deserved a special treat of our own! My incredible basket included 24 nibblers, 18 brownie bites, 12 mini muffins, 2 frosted cookies, and 6 oz of popcorn clusters. Holy yummy. All of the treats were bakery fresh and absolutely delicious. 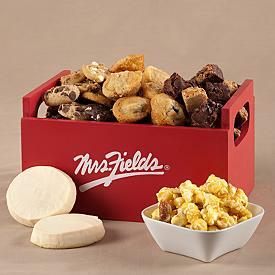 I live over 30 miles from the closest Mrs. Fields, so imagine how excited I was to have amazing baked goods delivered right to my door! I have to admit, I was reluctant to share…but ultimately shared the treats with my husband, and even allowed the kids to sample some of the basket’s goodies. My hands-down favorite thing in the basket were the mini muffins! I knew Mrs. Fields made incredible cookies (the white chocolate macadamia were my favorite cookie), but I couldn’t stop eating those mini muffins! SO good! 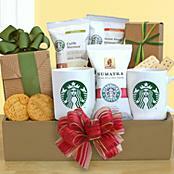 Another basket I considered was a Starbucks basket. My husband recently gave up his daily trips to Starbucks, and I knew a basket full of goodies from his favorite coffee shop would brighten his day. Shari’s Berries has a wide variety of holiday gift baskets to choose from. Whether you are looking for a quality fruit basket, a sampling of cheeses, wine, or even Godiva chocolates or Starbucks coffee, Shari’s Berries has what you want! 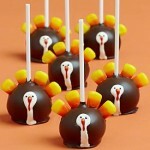 Whether you’re looking for an adorable holiday treat (seriously, check out these turkey cake pops!) or simply want to put a smile on the face of someone you care about…heck…if you want to give yourself a treat like I did, check out the wide variety of treats and gifts that Shari’s Berries has to offer! “Like” Shari’s Berries on Facebook! and have a delicious holiday season! I received free product in exchange for an honest review. No other compensation was received. All opinions are my own.